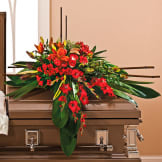 In his honor present a beautiful half casket spray of red and green. 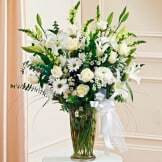 • Designed with roses, lilies, gladiolus, alstroemeria, leucadendron, ti leaves, aspidistra, fatsia, flax, ruscus, fern and jade. • Measures 34"H x 44"W x 33"D.